Review - New and Used BLAB! New & Used BLAB! is in two halves, new and used. The new material is not that new however since the book was published in 2003 and some of it has appeared in the BLAB! publications from Fantagraphics. Each half is 96 pages long, and is full of astounding illustrations. 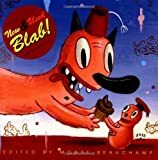 In his introduction, editor Monte Beauchamp explains that he was first driven to create BLAB! in 1986 out of desperation with his job in corporate advertising. BLAB! consistently contains bizarre and startling images, some very crude and some very polished. Many of the artists provide content that seems like repressed material from the artistic unconscious. It seems ironic that Beauchamp comes from the world of advertising because so much of the artwork in BLAB! seems like outsider art from untutored people with no connection with commercial work. I wish that the book contained more information about the artists since it be very interesting to know whether they earn their living helping large corporations sell their products or whether they live on small rations of food in dark basements in the poorest parts of the city. Fortunately for most of the artists, it is possible to put their names into search engines and discover their own web pages, which often contain some biographical information. Maybe my favorite work here among images I hadn't previously seen is "Pax Americana" by Douglas Fraser, which consists of 3 pictures in color. The central one covers two pages, and features a futuristic painting showing an industrial city with tall factory chimneys and dark skyscrapers in the background, with fleets of war planes in the air. In the center of the picture is some kind of fire-breathing bulldozer and in the foreground are computer works sitting at their terminals and fast food clerks carrying trays with burgers, fries and a soft drink, ready to serve for a new world. Buried in the spaces of the picture are skulls and farm animals. The dark gray colors of the weapons and buildings are contrasted with the red sky and the flames of the central destructive machine, and the bright red stripes on the oil drums and the cheerful clothing of the fast food workers. It is an apocalyptic vision powerfully crafted. This is just one piece in a book full of excellent work, which deserves a wide readership.